Aerial mosquito spraying is underway in Dallas County and Houston to prevent the spread of West Nile virus while the disease spreads farther, faster and earlier in the season than ever before, according to the U.S. Centers for Disease Control and Prevention. Only 29 cases were reported a month ago. Now, the CDC is reporting 1,118 cases spread across 47 states, with 41 deaths. Seventy-five percent of the cases have been reported from five states: Texas, Mississippi, Louisiana, Oklahoma and Illinois. Texas appears to be the hardest hit, with 586 reported cases in total. The death toll in Texas was 21 as of Wednesday, with Dallas County hit hardest, for a total of 270 cases and 11 deaths. No place is striking back harder against the West Nile virus than Texas, which has launched an aerial assault against mosquitoes despite objections from environmental groups. Overnight, planes carrying pesticides took to the skies dousing more than 63,000 acres of land in Dallas and Houston to battle the disease. "These kinds of chemicals are most toxic to young children, infants and babies," said Jennifer Sass, senior scientist at the Natural Resources Defense Council. The CDC and health officials in Texas insist the worries about the spray are overblown and pale in comparison to the devastating effects of the disease. 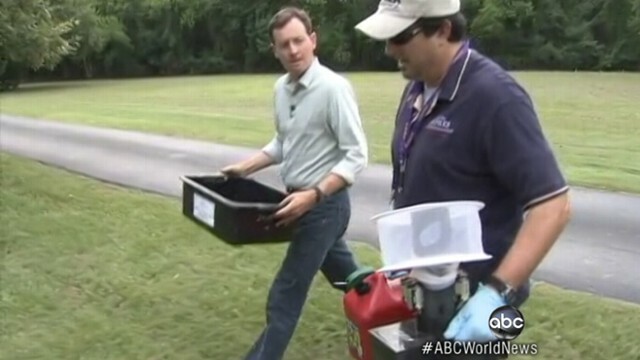 Harris County Mosquito Control Director Dr. Rudy Bueno told ABC News that the spray is "very safe and effective." "We normally kill 90, 95 percent of the mosquitoes that are out flying the night we put this out," pilot Malcolm Williams said. The CDC says this outbreak is on track to be the worst in the country's history. The worst year on record is 2003, in which the country saw 9,862 cases of West Nile virus infection and 264 deaths. Many experts point to last year's mild winter for the drastic outbreak and the scorching temperatures this summer, helping the mosquitoes thrive. Eighty percent of the people who contract the West Nile virus have no symptoms and their body eventually gets rid of it, according to the CDC. The remaining 20 percent experience flu-like symptoms. One in 150 people will develop more severe forms of the disease and experience neurological symptoms and brain swelling, according to ABC News' Dr. Richard Besser. Patient Garrick Larson told ABC News affiliate WDAY in Minnesota, "I woke up with a headache like I have never come close to feeling before. The pain was immense. I knew I was in trouble." Larson, a cross country coach in Moorhead, Minn., was hospitalized for a week with a high fever and meningitis. Deputy White House Press Secretary Josh Earnest briefed reporters aboard Air Force One as President Obama traveled from Las Vegas to New York Wednesday. "The president's been briefed on the increase in the number of West Nile virus cases," he said. "[The] White House staff are at regular contact with the experts at the CDC, and the president will continue to receive updates as necessary." West Nile Worst in US History?